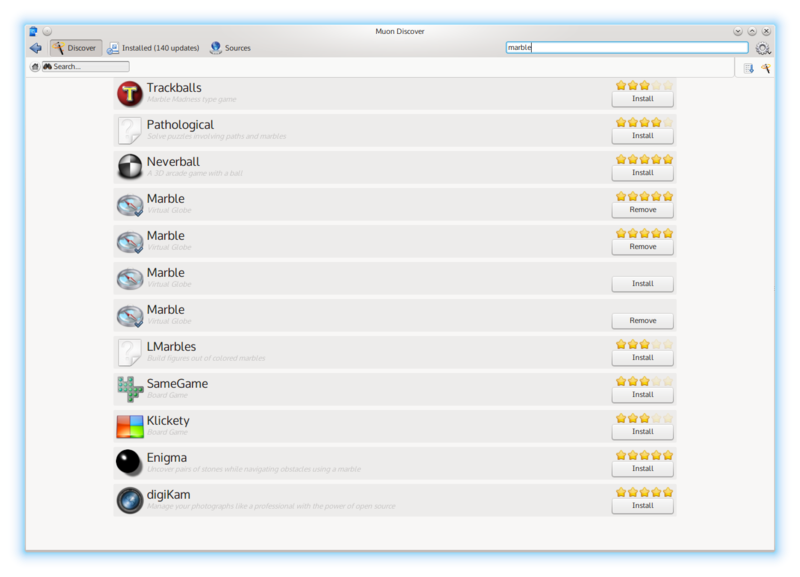 The marble package incorrectly contains two different user interface versions (desktop and mobile), additionally both versions identify as "Marble" in applications menu (desktop entry) and users can happen to launch the wrong Marble which gives an unintended and unacceptable user experience. the GUI is broken on the desktop anyway, should a future patch release improve the experience we can look into splitting the packages properly. The Menu in Marble 4:4.13.0-0ubuntu1 (KUbuntu 14.04) is squashed together and partially unreadable. It looks like Marble was build with a Mobile UI instead of the Desktop version. It behaves differently when launched from the terminal though and the non-mobile UI is launched. And indeed it adds two entries with the same name but one launching the mobile version and one launching the desktop version. I just died a bit inside. 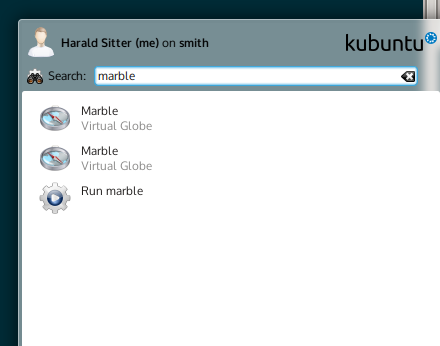 Yeah, please report that at http://bugs.kde.org against marble, but I presume there was a reason the devs called all of it Marble even if it is confusing if one has multiple Marbles. Oh, I forgot: Even if this is the mobile (touch?) version it should probably not look like that on the Desktop. Should I report this upstream as well? Yeah, the broken appearance probably also deserves a report a bugs.kde.org. - The .desktop files should call the respective application just Marble. One approach would be to add cmake switches to disable building some of the applications. The drawback would be that packagers need to know about them, so we'd likely end up in the same situation as now. Another approach would be trying to be clever of which .desktop files are installed: The KDE one if KDE libraries are found, the mobile one if the cmake MOBILE flag is set and the Qt one otherwise. The result would be that just one .desktop file would be installed in any case. The drawback ist then that building multiple binary packages from the same source (marble, marble-qt) becomes impossible. Well, to be honest the notion using Name=Marble is the real problem. Separation etc. ought, and is, done on distro level anyway (except for a few, to mind comes slackware which does not produce split binary units from one source unit). But if the user installs more than one marble it's impossible to tell which is which  (generic name being the same doesn't help either, but there's menu implementations that do not actually show the generic name at all anyway...). Arguably this is not really a major issue because the user should only ever need to install one anyway. But, that is where the same Name for different binary units becomes even more annoying. For example ubuntu's app-install data is the metadata powering the software store, this data is autogenerated from desktop files. 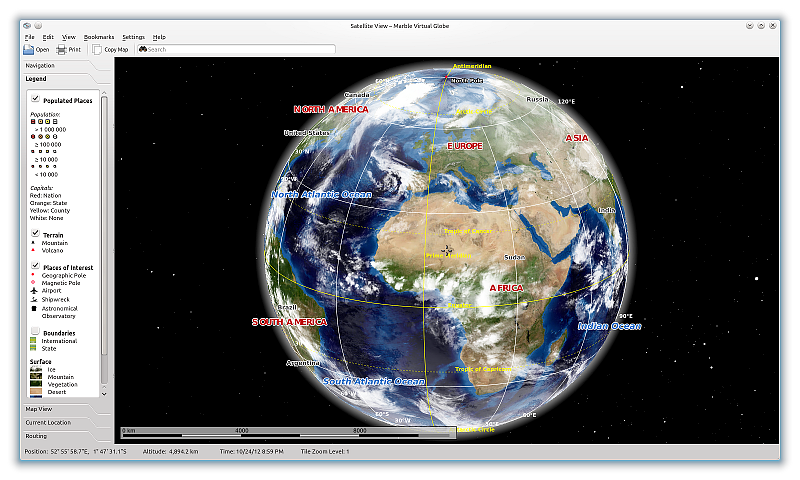 For marble you therefore get 4 distinct entries in the ubuntu software store and muon discover . ^ In addition to that one could then still have desktop files that have a distinct more technical name like Name=Marble Qt. Packagewise I think most distributions (or at least the ones that split the binary units into different packages) can represent that sort of dependency on a packaging level. So, you have the starter package, which needs at least one of the GUI binaries. Independent of everything you have the gui binaries in their own package. Finally you have the GUI specific desktop entry packages that allow the user to explicitly start a specific GUI once those packages are installed. Mind you, the starter could also display a selection when more than one GUI is installed, the GUI specific desktop files could be dropped altogether as you can then start all guis through the starter even when all of them are installed at the same time. LibreOffice does something similar with their starter I think. There is only one entry in the applications menu, and it launches the desktop UI. resulting in confusion over which marble is going to be started. 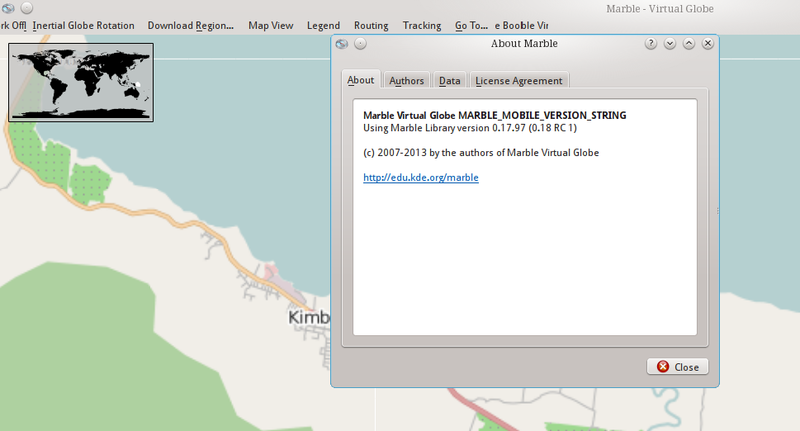 The verification of the Stable Release Update for marble has completed successfully and the package has now been released to -updates. Subsequently, the Ubuntu Stable Release Updates Team is being unsubscribed and will not receive messages about this bug report. In the event that you encounter a regression using the package from -updates please report a new bug using ubuntu-bug and tag the bug report regression-update so we can easily find any regresssions.